← Mike Vallely – Veganism, Street Plant, and what started it all. 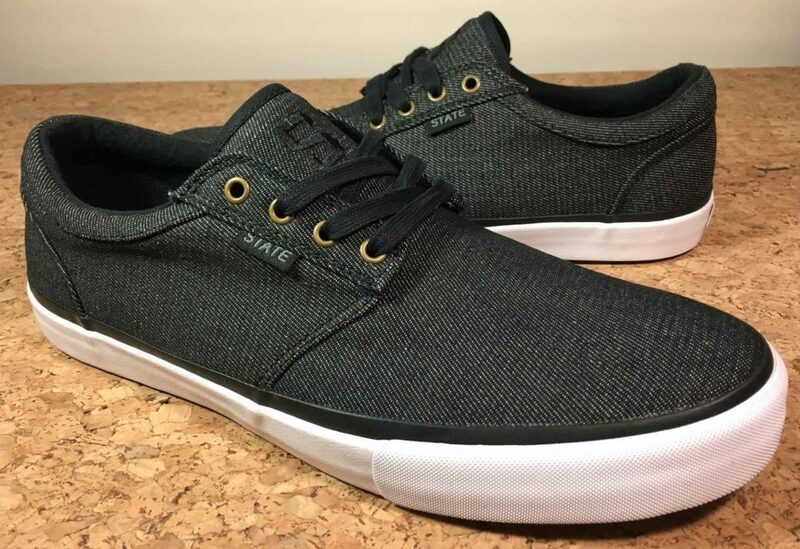 The State Elgin is just one of several vegan models from this new skate shoe brand. 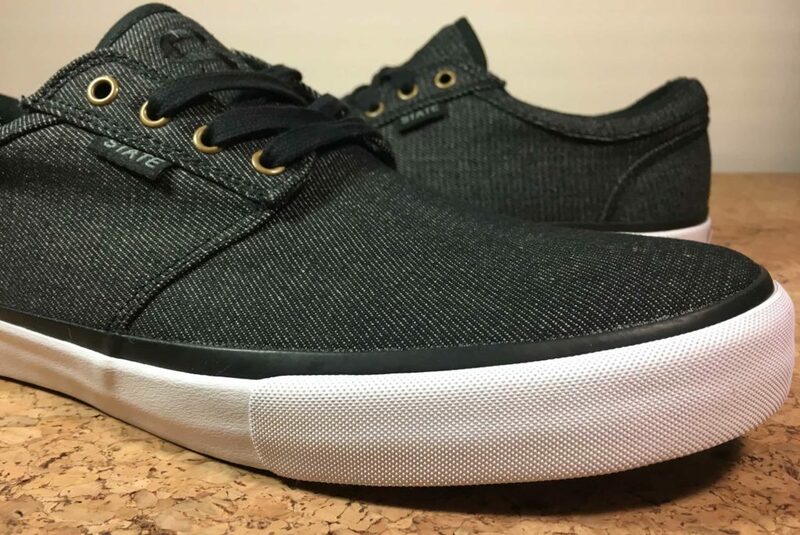 This classic silhouette features a denim canvas upper in black/white (there is also a grey chambray colorway). With minimal padding in the tongue, collar and toe, this is truly a shoe for the minimalist. The real skate durability isn’t going to come in this denim upper. 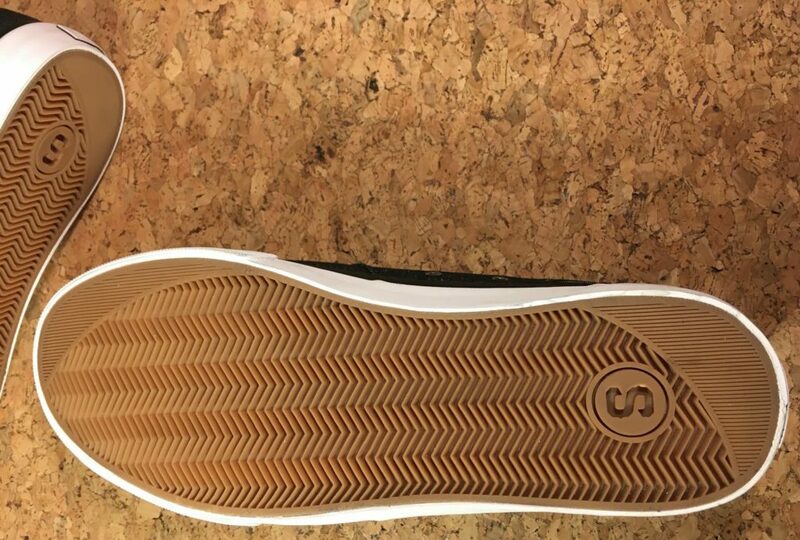 Instead look closer at the double-wrapped (or reverse wrapped) vulcanized sole. The extra width in the textured foxing tape around the toes gives a lot of extra flicks and ollie before the upper gets the business end of the grip tape. The Elgin’s gum soles herringbone pattern is straight forward. Nothing fancy just good old fashion grip. The styling remains true to the legacy of Dekline who recently called it quits. Kevin Furtado the brand director of Dekline launched State as a price point brand. (Read more at JENKEM) Focusing on a few solid models in two or three colors. He is running as a barebones garage operation. So while State Footwear is selling in Zumiez, this is a small operation and you can supporting the brand directly. We would love to see a good use of the new synthetic materials on State’s offerings. That might not be coming though, given the mission of the brand and reality of the shoe industry. Casual cruising in the canvas models. Get yourself some Shoe Goo for heavier ripping and some thick socks.